Looking for an uncomplicated and unconventional road trip this year? Consider Scottsdale, Arizona. The journey from Los Angeles is a snap, there’s lots to do, and the food won’t disappoint. In short, it’s the perfect drivable destination for Angelenos looking to change things up. Known for its golf courses, spa resorts and stunning desert trails, Scottsdale is a quintessential vacation spot. But this desert city has a whole lot more to offer than pool time and tee times. There is a thriving wine scene, superb restaurants and exceptional hotels. For art enthusiasts, the city is dense with culturally significant artist communities, historical architecture built by icons such as Frank Lloyd Wright and Paolo Soleri, plus numerous publicly funded community art works and projects. 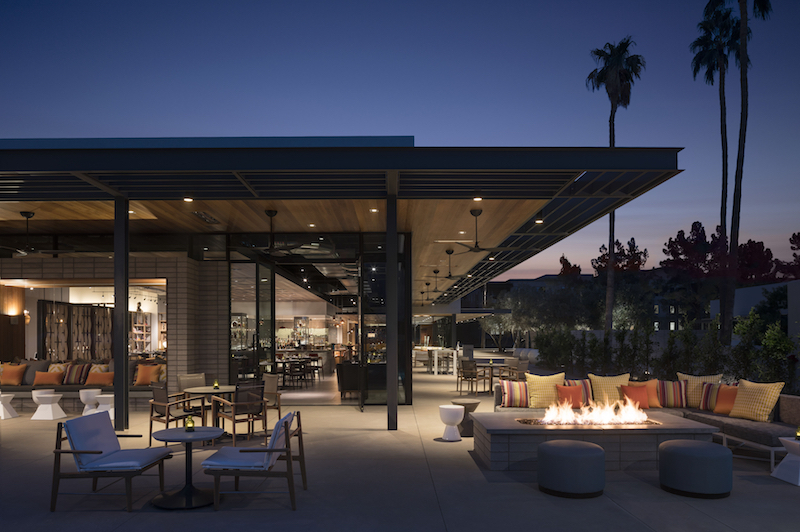 To get you started on your exploration of Scottsdale we’ve put together a three-part guide to fill you in on all the sights and bites. In this section, we’ll cover the best times to visit, plus a few exceptional lodging options. 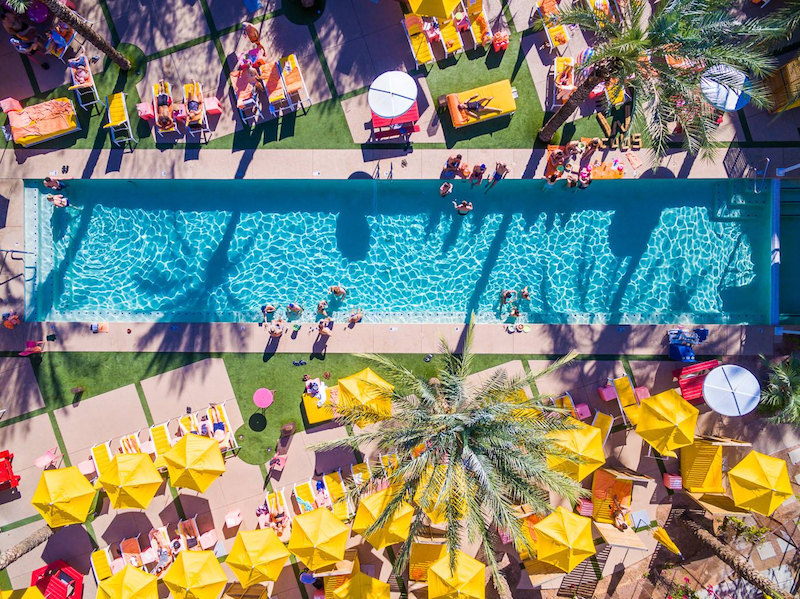 In part two, we’ll dive into the best things to do in Scottsdale. Lastly, part three will provide a list of great places to eat. So fill that tank, grab a friend, and pack your overnight bag. The southwest is calling. 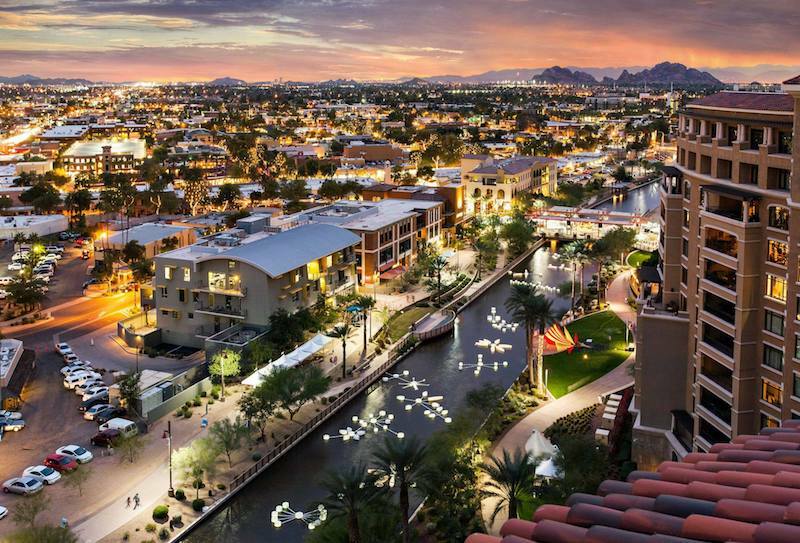 When is the Best Time to Go to Scottsdale? 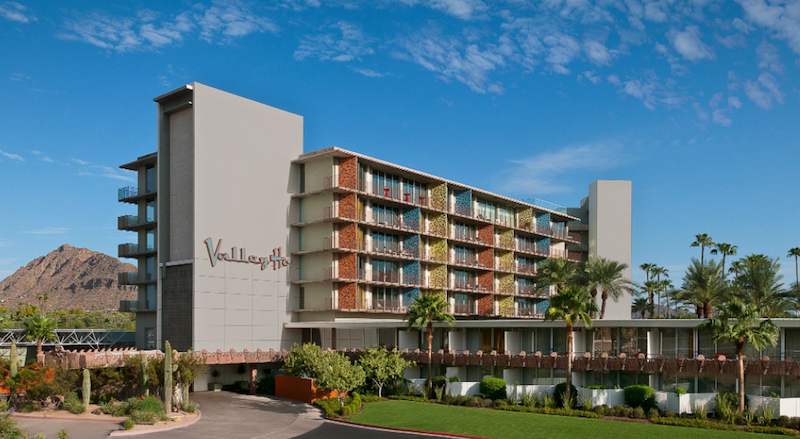 Peak season to visit Scottsdale is from January to April. Highs temperatures average in the low 70s to low 80s during this period, making it both the most desirable and most expensive time to visit. If golfing, hiking and other outdoor activities (like MLB Spring Training) are on your agenda, this is probably your ideal window to be in town. From May to June, the area experiences a dry summer where temperatures often spike into the triple digits during the day. This dry period is followed by the “wet summer” from July to mid- September. The daytime temps stay up, but the air is more humid, with afternoons cooling off and sometimes inviting thunderstorms via air drawn up from the Gulf of Mexico. If you wish to avoid the high temperatures and humidity, consider visiting during the winter season, when temperatures are mild and nights are brisk. Fall temperatures are in the high 80s — still pleasantly warm, but the city boasts clear skies and crisp evenings. My road trip to Scottsdale took place during mid-May, and for what it’s worth I experienced both sides of the weather coin. 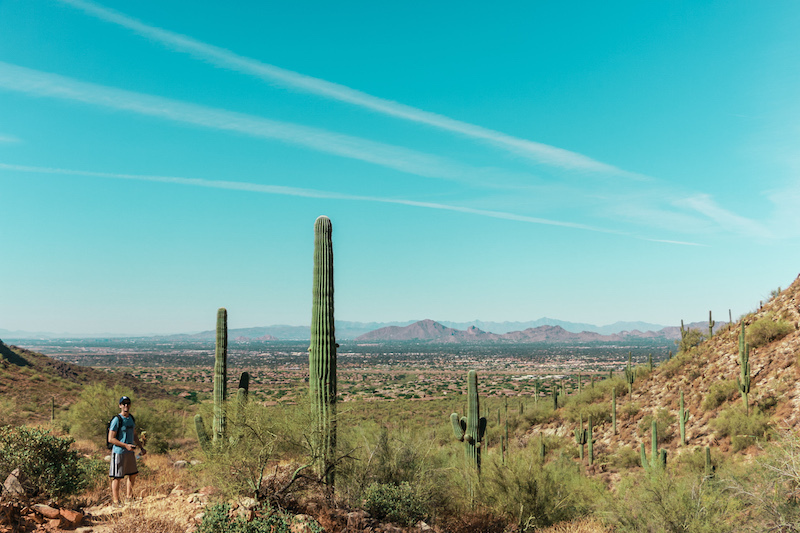 On the first half of my trip in I was in pleasant 80-degree weather teetering into the 90s at times, which was enjoyable when exploring the city and taking a morning hike at the Sonoran Preserve. The last two days the mercury leaped up to 105. I spent most of my daytime indoors at attractions like The Scottsdale Museum of Contemporary Art and Scottsdale Fashion Square. Regardless of when you choose to visit Scottsdale there are going to be some tradeoffs. The benefit of traveling in the off-season is scoring a big discount on extraordinary hotels. The downside? It’s HOT! Also here’s one final pro-tip: Whenever someone offers you a bottle of water, always take it! Hydration is key. The drive to Scottsdale is a 5.5-hour (sans traffic) straight shot on the 10 freeway. You’ll pass through the San Gabriel Valley, Riverside and Palm Springs. Ultimately Blythe will be the last California city you’ll see before entering Ehrenberg, Arizona. There’s a certain stark, minimalist appeal to the landscape along the way. You might just call it barren. For me the real highlight was when I started seeing majestic brick red mountains and towering saguaro cacti that line the Sonoran desert. It’s said it takes about 10 years for a saguaro to reach even 1 inch in height, and it isn’t until around 70 years of age when the plant will reach over 6 feet tall and finally begin producing its first flowers. On my drive, and all during my stay in Arizona, I routinely saw 10 to 20-footers. It inspires a certain kind of awe, I think. One note: Be sure to stop for coffee and gas up in Palm Springs because there isn’t much in the way of gas or food once you keep driving east, or at least not in between Indio and Blythe. Visit www.experiencescottsdale.com for more information on Scottsdale Arizona.